Jim Corbett is probably one of the first names that pops up while planning a weekend getaway from Delhi. 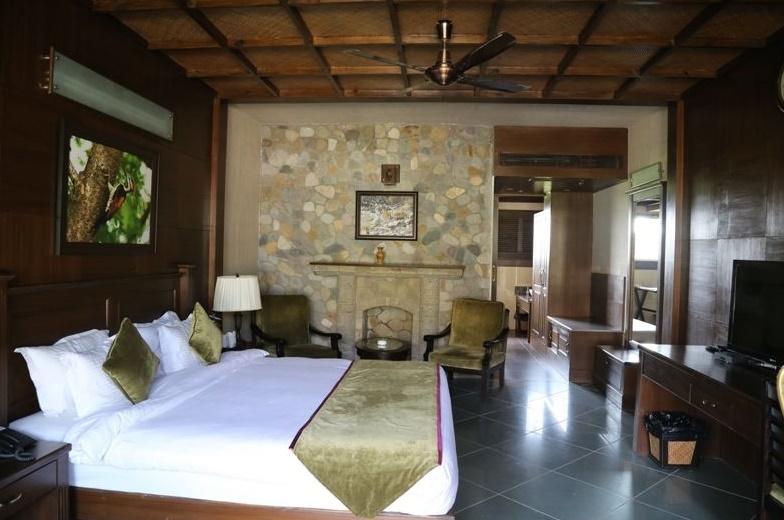 However, the relatively new Aahana Resort gives you plenty of reasons to plan a longer trip with your spouse to the rustic town of the tiger. Set out on a detox spree with with Aahana’s holisic therapy packages tailored to your needs and designed to uplift and rejuvenate. The six hour long drive from Delhi made me ready to make a beeline for the spa but the traditional welcome drink made of Buraansh, the local red flower filled with healing properties refreshed me in a jiffy. I was excited to take a walk around for the first look of this beautiful property. The vintage Chariot at the entrance of the reception took me back in time while I got accustomed to the steady but subtle aroma of lemon grass that is grown in abundance in the property. I was explained that the fragrance of the grass kept mosquitoes away and sure enough there was none. If you reach late in the evening, you will have to wait for the sunrise to gasp in the beauty of the property, like I did. The Victorian architecture of the rooms was charming and the extensive use of wood is typical of a forest resort. The animal paintings and decor reminded me that I was staying very close to the jungle. The well-equipped rooms came with the added benefits of beautiful views and continuous supply of fresh air from the balcony. Aarogyam Holistic Health Spa at Aahana is equipped with an extensive spa menu complete with Ayurveda, Western Spa therapies, Naturopathy, Yoga, Acupressure, Reflexology and many other alternative therapies by their own wellness experts. Organic home-grown plants and medicinal herbs are used for all the therapies. The couples detox packages maybe one-three weeks long as per your choice and requirement. A complete spa package, exercise routines, and diet plan is drawn out exclusively for you by Aarogyam’s trained doctors and experts. Since I was here just for the weekend, I tried the Aahana Signature Massage which was a mix of different massage and spa techniques spread over a good 90 minutes. Coming to the food, Dikala, the multi-cuisine restaurant at Ahaana, serves food with just the right balance of modern and traditional flavours. The spices are kept moderate and aren’t overpowering. There is an exceptional simplicity which is like a breath of fresh air when it comes to resort food (which usually tries too hard to please). My personal recommendation would be the local Kumaoni dishes (not part of the menu but served on demand). However, the Chinese and North Indian items on the menu too, won’t disappoint you. 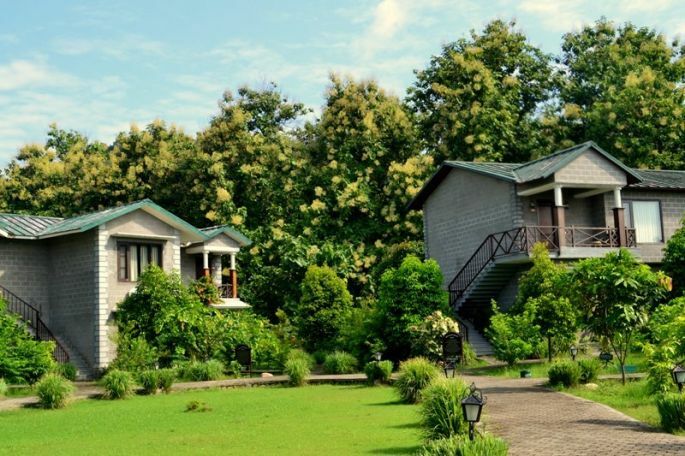 The eco-friendly resort is a paradise for bird watchers and spotting variety of wild plants, thanks to the resort’s policy of preserving the natural forest landscape. Around 100 species of birds have been spotted and identified in the premises, a list of which is stands proudly in the garden. A narrow passage between the reception and the rooms is left open to allow villagers and the four-legged inhabitants of the area to pass freely. The entire property has been landscaped with forest species and grasses to provide extended space to wildlife. Though the chances are slim, you just might spot a jackal, deer or even the mighty tiger from the balcony of your room, as the resort lies adjacent to the Bijrani zone of the Corbett Jungle. Even though I wasn’t lucky enough for a sighting, just the thought of staying in such close proximity to the unexplored wilderness is a thrilling one!